From a base in Kassel, Germany– once the home of fairy-tale masters the Brothers Grimm — entire panzer divisions of invading Waschbaren (“wash bears”) have been fanning out across Europe for decades. Native to North and Central America, the raccoon first sailed east across the Atlantic in the 19th century, when its furs were in high demand by the fashionistas of the day. 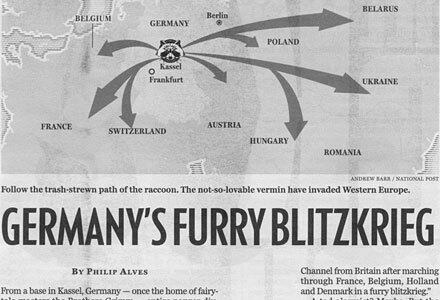 Periodically, a few captive raccoons did manage to escape (in one incident, for example, an Allied bomb hit a raccoon farm outside Berlin in 1945, liberating dozens of the furry inmates).